This self-enforced means of keeping the citizenry law-abiding resulted in relative serenity in the Township for the next 70 years. That calm came to an end on January 21, 1876, when a transient named Charles M. Sterling brutally murdered a woman named Lizzie Grumbaker on a hill in the east end of the township, near what is now the Center Street Bridge in Struthers. The man was tried among a huge crowd of spectators, who paid 10 cents each for their seats. This money went into a compensation fund for the victim’s family. The first trial resulted in a hung jury, so the proceedings were shipped to Youngstown, where Sterling was convicted and executed on April 21, 1877. Records for the next several decades are sketchy, but we know that the election of November 1917 saw Paul Simon winning a landslide victory for the position of 1918-1920 constable. C.L. Baldwin was the victor in the 1921 election and took up his position as the next two-year constable. In 1929, J.R. McKay and Frank French were elected constables for the 1930-1932 office. In August of 1936, the constable’s office moved into the brick WPA building at 5105 Market Street, sharing it with the Boardman Fire Department. This building would be the home of the Police Department until 1992. In 1939 when William Hacker and Frank French were part-time constables, a bill was passed that required all constables to wear a uniform and have special auto markings to make them more visible. Constables were responsible for offsetting their own uniform and auto sign expenses. This caused a considerable financial burden owing to the fact that constables were only paid $25 a month. Frank French resigned as a result of this decision, finding it to be too great a burden in the Depression years. The small group of constables who served from 1806 until the 1930s held an unpaid position. The only salary a constable received from the township came from the small fee he was paid for serving a warrant. Duty was carried out on a bi-weekly or bi-monthly basis, with one constable on call at all times. Each constable was responsible for producing a public bond to back up their reliability before they were allowed to take the oath of office. No prior training was necessary to wear the badge, only self-provided transportation and a weapon. The position of constable remained highly political, as constables were elected until the 1950s. The 1940 census shows Boardman’s population was 7,881. The only protection those residents could count on were the one or two constables hired per year and possible assistance from Mahoning County Sheriff’s Office. Something had to be done to further secure this growing area. With entrepreneurial brains ticking away, Boardman was well on its way from 19th- century wilderness to the retail Mecca it is today. This was when township officials realized the need for a steady, full time police force to do more for the community than settle fence line disputes and return loose livestock. In January of 1950, Don Robinson was sworn in as the Township’s first part-time appointed constable and was paid $50 for the first half of February. In 1951, Don Robinson and H.W. Mansell became the Township’s first full-time constables. Trustees budgeted $600 for the 1951 Police Department, and raised the constables’ pay to $75 per month. The Township installed a mobile phone in H.W. Mansell’s car, and also purchased two mobile radio units and a base unit for the police station. By January of 1952, the Department had three full-time constables, with Don Robinson as Boardman’s first police chief. On January 1, 1954, 24-hour police service went into effect with a rotating fireman to answer the phone between midnight and 6:00 a.m. This decision made an officer available at all times, and Boardman now had a true police department. Acting in a full-time departmental capacity, the constables were in great need of fundraisers and drives to pay for necessities such as uniforms, guns, handcuffs and gasoline. In May of 1955 the officer roster grew to seven officers. Interestingly by 1958, the constables’ fundraisers had produced enough money to donate a car to themselves to be used as the township’s first official police cruiser. In early 1960, it was business as usual for the occupants of 5105 Market Street. In February, the constables purchased two riot guns, one for each police cruiser. Boardman Township’s first woman dispatcher, Ruth Newcomb, was hired in March. Later that year, Boardman Township funded the purchase of a 1961 Dodge two-door sedan pursuit cruiser. Equipped with a 275 horsepower engine, power brakes, and a toggle switch to disconnect lights allowing the vehicle to “operate in total darkness,” this black and white cruiser was state-of-the-art for 1960. Another technological innovation came in 1962 with the purchase of a “Drunkometer” to measure blood alcohol levels in suspected incidents of drunk driving or public intoxication. In response to unruly teenagers in the Township, in 1963 the Boardman Police Department sent Charles Price to Columbus for a workshop on juvenile delinquency. This was a first attempt at a type of juvenile diversion program, and also showed evidence of Boardman’s early commitment to community policing. In December 1964, a two-way cruiser radio allowed communication between a dispatcher and officers so that continual stopping at the station was no longer necessary. This made policing more efficient. In December 1965, Boardman purchased its first radar unit for $995. By 1966, BPD was declared a “full police department” by township trustees, meaning there was one chief, ten full-time constables, and three part-time constables, all acting in various capacities and at levels such as sergeant and captain. In the fall of 1968, the Department commissioned an investigative unit, thus expanding the Department’s specialization. Technological improvements continued in 1974 when Boardman gained access to LEADS – the Ohio Law Enforcement Automated Data System. LEADS was a way to automatically run license plates and information, cutting down the time of traffic stops and making policing even more efficient. In May 1975, Boardman installed five statewide Law Enforcement Emergency Radio Network (LEERN) radios in police cruisers so officers on duty could keep up-to-date with situations developing in neighboring areas. In April of 1976, the Department appointed its first juvenile officer, working with cases involving the Township’s youth. Mary Lou Mueller became Boardman’s first female police officer in March of 1978, paving the way for women of future generations by her bravery and determination. Later in 1978, Civil Service was implemented to regulate standards of government workers. In 1987, the Township issued a new rule: “All successful applicants for employment must be residents of Boardman Township within twelve months of their starting date.” The reasoning was that an officer called out on an emergency that lived elsewhere could never respond as quickly as an officer living in Boardman Township. Also, residing in the area gives officers a greater sense of community and would aid in community policing, which has always been a part of the Boardman Police Department. In 1989, Boardman Police became the first department in Mahoning County and one of a few in the country to implement the DARE Program, short for Drug Abuse Resistance Education. The program was designed to incorporate comprehensive drug awareness into school curriculums. Later that spring, the Law Enforcement Fund was established to sponsor the Mahoning County Drug Task Force. In August, talks were in progress for the construction of a new police station. At the time, it was assumed that the new station would be an annex of the old building. When a new location was chosen farther south on Market Street, Township officials agreed that there would be room for not just the police station, but a comprehensive government facility. Also in August, Boardman Police Department formed the Crisis Response Team. This tactical team was in charge of high-risk police work. And the Department instituted a campaign called “Saved by the Belt” to recognize citizens whose lives were spared by seat belts and encourage seat belt usage among others. In the spring of 1991, the Department purchased a German Shepherd police dog for use in criminal investigations. Michael Hughes and “Dino” became Boardman’s first canine unit and handler. Around this time, Architect K. Anthony Hayek was hired to construct the Department’s new facility. Later that fall, the application for the Juvenile Justice and Delinquency Prevention Formula Grant Program was approved for funds to start a Juvenile Diversion Program. In its growth, Boardman expanded its a mutual aid agreement to include Springfield Township, Poland Township, Poland Village, Youngstown, Struthers, Beaver Township, Canfield, Austintown Township, Mill Creek Park, and the Mahoning County Sheriff’s Office. On May 22, 1992, Township officials dedicated the new government center. The police Department went from a ramshackle 1936 WPA building to a state-of-the-art facility. The new police station was completely computerized with a 911 system, central air conditioning, and separate wings for police and administrative offices. The radio room was equipped with 28 cameras to monitor security in and around the facility. The police wing contained an isolated booking area for prisoners, two interrogation rooms, a roll call room large enough for 74 officers, juvenile diversion offices, DARE Program offices, a records department, administrative offices, a conference room, a lunch room, offices for supervisors, locker rooms, a work out facility, a courtyard, and a spacious lobby. At the time, the building housed 48 police officers, eight dispatchers, five clerical workers, and two custodians. In 1997, the Department purchased a computerized voice stress analyzer for $10,920 from The National Institute for Truth Verification. This voice analyzer phased out the old polygraph test as a more accurate way of lie detecting. In December of 2002, the Boardman Police Department lost one of its finest. Rookie, a canine unit, was struck and killed by a motor vehicle. He became the only canine ever killed in the line of duty at the Boardman Police Department. As the Boardman Police Department moves further into the 21st century, the Department continues to grow to meet the needs of the expanding community. According to the 2010 census, 42,518 people live in the Township. They are protected by 56 police officers (including the Chief of Police) whose first priority is the safety and well-being of Boardman residents. These officers are supported by a staff that includes an Administrative Assistant., Dispatchers (ten full-time and one part-time), three Records Clerks and one Fleet Mechanic. 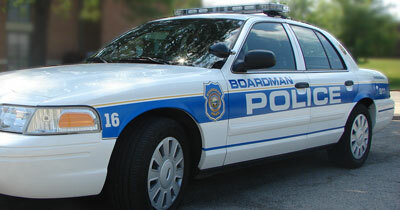 Boardman’s officers are making more arrests and answering more calls than ever before. 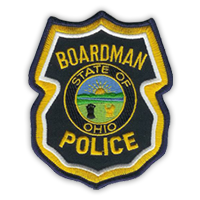 This is proof that the Boardman Police Department is striving for excellence in providing service to the public and improving the quality of life in Boardman Township.